Lance Casey & Associates can obtain a California Apostille Authentications for your birth Certificate, notorized document, notarized transcript, or legal document. Since we are located in Sacramento, we make every effort to submit your documents to the California Secretary of State the same day we receive it. The Secretary of State will take an average of 1 business days to Apostille or authentication most documents that are delivered in person for international use in accordance with the Hague Convention. My Apostille request is urgent, but I am not able to appear in person. What are my options? If your Apostille request is urgent but you are not able to appear in person, we can obtain your appostille certificate on your behalf. How to get an Apostille in California? Download the California Apostille Services Order Form. Attach the documents to be Apostilled to the order form and mail to 5-Star Legal Support Services, 2386 Fair Oaks Blvd, Sacramento, CA 95825. Cost of Apostille in California? What is an Apostille and what is its purpose? I have a birth or death certificate issued in California. 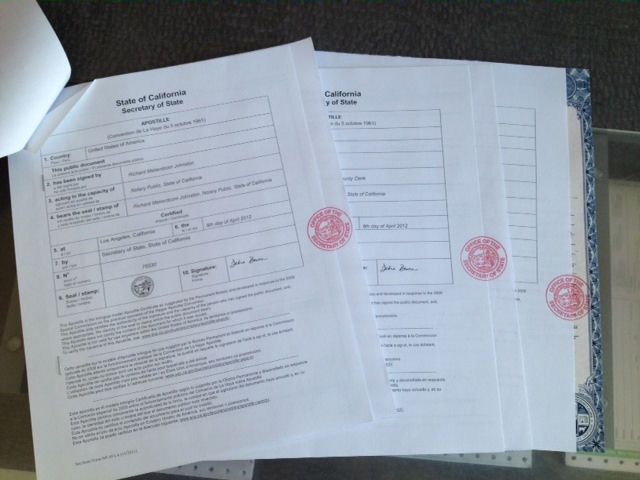 For which public officials’ signatures can the California Secretary of State issue an Apostille? the State Registrar (California Department of Public Health). obtain a certified copy from the county clerk or recorder. The signature, name, and title of the public official can be found at the bottom of a birth or death certificate. Can I get an Apostille Services California for a territory within the United States, e.g. Puerto Rico? No. Apostilles can only be issued for documents to be used outside the United States of America. Accordingly, we do not issue Apostilles for Puerto Rico, Guam, United States Virgin Islands, Northern Mariana Islands, American Samoa, or any other American territories or possessions. Generally, the notarial act is sufficient for use in any American territory or possession.